He put the screen door up today so winter if Officially over! it’s been a lovely warm week, Two days now since we’ve had a fire. Mom in law is coming for a week so I have to do spit & polish this week getting ready so not much progress for the weaving. Started my Ravelry WAL yesterday but for once, I did Plan Ahead so that it should run without too much work on my part. If you want to join in, it’s dolls, of course. 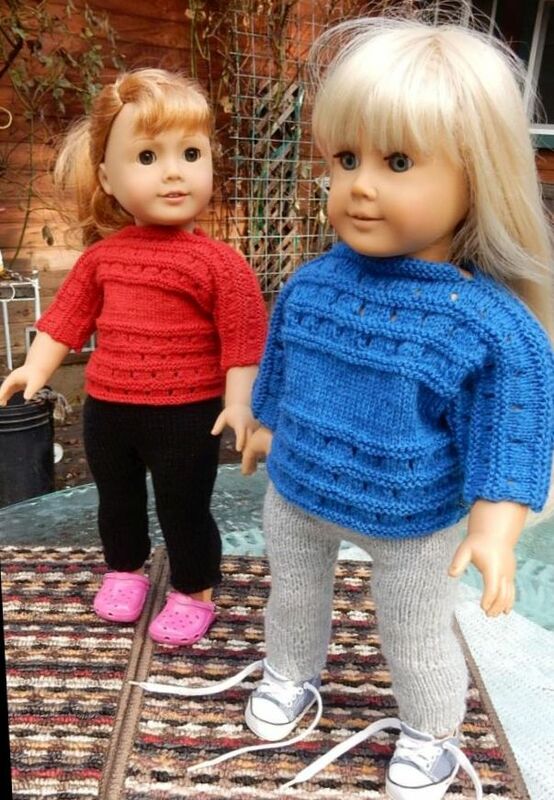 American Girl Doll Knitters on Ravelry. Here’s Ellie & Kirsten goofing off in a pre-photo shoot wearing the new pattern. One of them. There’s more! For the 18″ & the 6″. And I cooked the last turkey and have it made into MRI’s. Also canned beans this week. Boy! ain’t I been busy! lol Just wanted to check in. I get the loom out when the ball game comes on so still working at it, just less time now. Hope you are all getting your gardens in and the spring cleaning out of the way s0 you can get back to weaving, too!